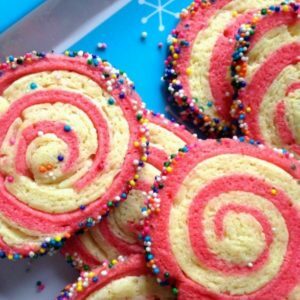 These pinwheel cookies aren’t really hard to make, but it is important to follow the directions carefully. If you don’t have time to finish them all in one day, you can place the roll in the refrigerator for a couple of days before you cut the cookies. You can even freeze the roll for several months. It is very important for this recipe that the butter be cold. I have made the mistake many times in the past of warming up the butter so that it would mix into the dough better, but if you do that your cookies will spread in the oven and become very thin. In a food processor combine the flour, baking powder, salt, powdered sugar, and sugar. Pulse a few times. Cut the 2 1/2 sticks of cold butter into small chunks and place in the food processor with the flour mixture. Process until the mixture resembles coarse crumbs. Add the egg and 1 tsp. vanilla extract and pulse again. Remove half of the mixture from the food processor. The mixture will be a little bit crumbly. Note: If you don’t have a food processor, you can also use a stand mixer to mix the dough. I have tried it both ways and it worked fine either way. To the mixture remaining in the food processor, add food coloring, 1/2 tsp. vanilla extract, and 2 tbsp. flour. You will have to use your judgment to decide how much food coloring to put in. Some people put up to a whole container of food coloring in, but you can put in less. Start with 15 drops or so and take it from there. Use green or red for Christmas. If you are making these for another holiday or a birthday party, try blue, yellow, even purple to match the theme of the party. Process the mixture in the food processor until it is well combined and the color is distributed throughout. You should now have two balls of dough, one white, and one colored. Place each half of the dough between two sheets of waxed paper and roll out each half into the size of a rectangle, roughly 9 x 11. The dough should end up being 1/4 inch thick. Place the two sheets of dough in the refrigerator for at least 2 hours. Remove the dough from the refrigerator and peel the waxed paper from the dough, carefully layering the two sheets of dough on top of each other. Use a sharp knife to trim the edges of the dough so that all of the edges are even. Let the dough sit for a few minutes until it is soft enough to roll up. Starting at one of the short ends of the rectangle roll up the dough as tightly as possible to form a log of dough. If the dough cracks, just press it back together with your fingers. If the dough falls apart on you, don’t give up on it. Let it warm up a little and then you can roll it out again. This dough is very forgiving (ask me how I know). Place about 1 cup of sprinkles of your choice in a shallow pan and roll the log of dough in the sprinkles, gently pressing the sprinkles into any bare spots until the dough is completely covered with sprinkles. Place the log back into the refrigerator for a couple of hours. This is necessary so that it will be easy to cut. At this point you can leave it in the refrigerator for up to a couple of days or wrap tightly and store in the freezer for several months. Cut the dough into round slices at least 1/4 inch thick and bake on cookie sheets lined with parchment paper for about 15 minutes, or until barely browned. This recipe makes about 20 large cookies. 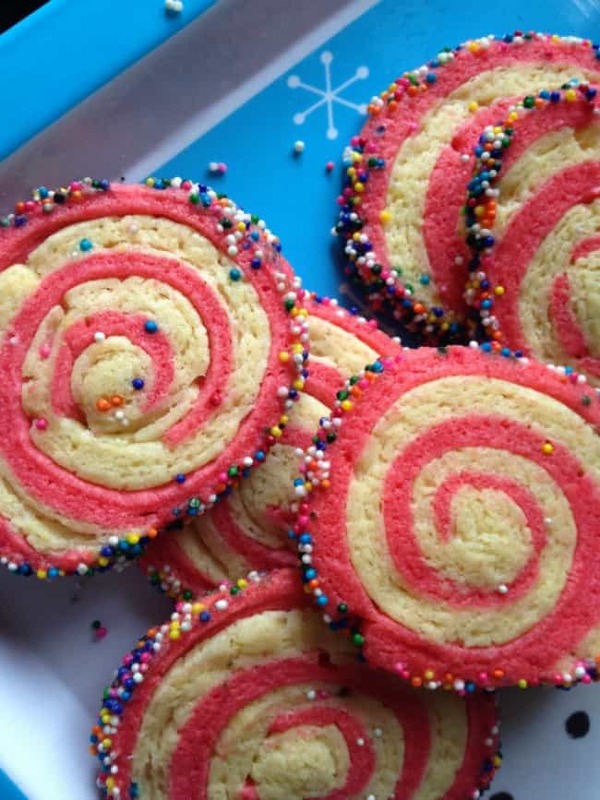 If you want smaller cookies, roll out the dough into larger rectangles to make a longer log.